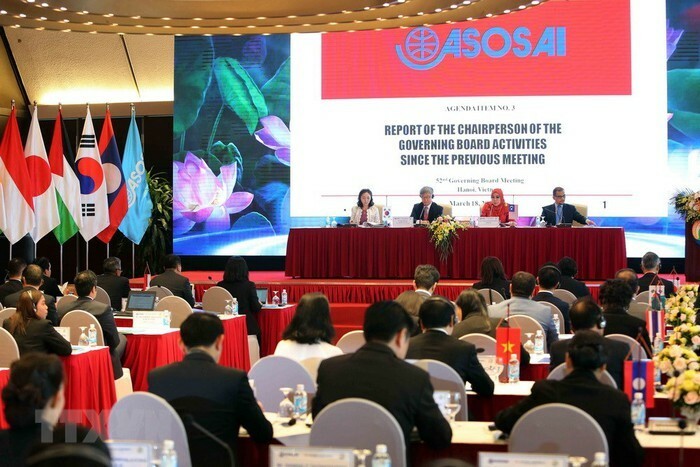 (VOVWORLD) - The draft Hanoi Declaration and plans for the next 5 years topped the agenda of the 52nd meeting of the Governing Board of the Asian Organization of Supreme Audit Institutions (ASOSAI) in Hanoi on Tuesday. The event preceded ASOSAI’s 14th Assembly which will open in Vietnam’s capital on Wednesday. Vietnam’s Deputy Auditor General Doan Xuan Tien said: “The 52nd Governing Board meeting provides an opportunity for member countries to share experience and learn more about Vietnam’s land and people. As ASOSAI Chair for the 2018-2021 period, the State Audit of Vietnam Office will do its utmost to make its tenure a great success”. 250 foreign delegates from all 46 member nations will attend ASOSAI 14, to be held in Hanoi and Quang Ninh province from Wednesday to Saturday. This is the first time Vietnam has hosted the biggest ASOSAI event. The ASOSAI Assembly meets every 3 years to discuss policies and development orientations, as well as to elect the organization’s Chair and governing board. This year’s meeting is themed “Environmental auditing for sustainable development”.